Go Girl Energy Dink is targeted exclusively towards women. It is sugar-free and also contains an appetite suppressant (Citrimax). Go Girl's caffeine can vary among flavors, see below for the exact amounts. Citrimax is primarily composed of garcinia cambogia extract, which is believed to prevent the storage of fat and suppress appetite. Some people experience nausea and head aches from this ingredient. The caffeine in Go Girl is a little less than most other energy drinks including Red Bull and Monster per ounce. 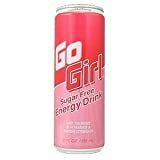 9 Pack - Go Girl Energy Drink - 12oz. 16 Pack - Go Girl Energy Drink - 12oz. Carbonated water, citric acid, taurine, malic acid, natural and artificial flavors, sodium hexametaphosphate, garcinia cambogia extract, caffeine, sodium benzoate, potassium sorbate, sucralose, sodium citrate, gum arabic, glucurolactone, red #40, inositol, magnesium oxide, niacinamide, calcium pantothenate, pyridoxine hcl, vitamin B12. How Does Go Girl Energy Drink Compare? Go Girl Energy Drink contains 8.70 mgs of caffeine per fluid ounce (29.40mg/100 ml).